You are here: Home / By Meat / Meatless / Ranch Veggie Pizza – with Hidden Valley Ranch Dressing! 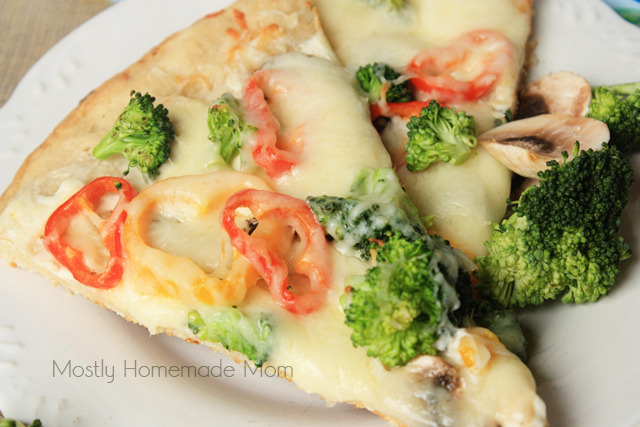 This easy and yummy weeknight pizza is loaded with broccoli, sweet peppers, and mushrooms over an amazing Hidden Valley Ranch Dressing spread, and of course smothered with cheese! I have been making different versions of this pizza over the years, and I finally feel like I have tweaked it to be one of my favorite pizzas ever. With the amount of ranch-flavored recipes on Mostly Homemade Mom, I don’t think it’s news to any one of you that I am OBSESSED with ranch dressing, of course Hidden Valley is my favorite. I’m actually really proud of this one, though. I hit the perfect combination of sweet, crunchy, and colorful veggies. The ranch dressing and cream cheese spread is out of this world, good! And plus, I made my own pizza crust this time. With yeast. I know – aren’t you SO proud! I am! I let it rise twice and everything. If you’re going for simple and fast, refrigerated pizza crust is the way to go though. Just take a look at those gorgeous colors – yum! I picked up a bag of baby sweet peppers and both of my kids devoured them. We had extra Hidden Valley Ranch pizza spread, so they munched on veggies and dip while the pizza was cooking. Aw, who am I kidding – so did I! Prebake pizza crust as directed on package (or recipe, if homemade) and remove from oven to cool slightly. While cooling, beat together cream cheese, ranch dressing, and sour cream with an electric mixer until smooth. Spread a generous amount over pizza crust (there will be some leftover, perfect for snacking). Sprinkle 1 cup shredded mozzarella, then evenly spread vegetables, and top with remaining mozzarella and parmesan cheese. Place pizza back in the oven for 5-8 minutes, or until cheese is completely melted and crust is brown. Serve immediately. This pizza is so SO good! 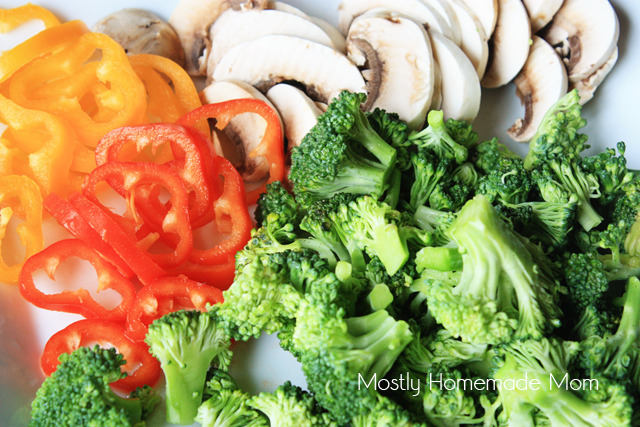 It’s such a great way to get your kids to eat their veggies, too – yum!